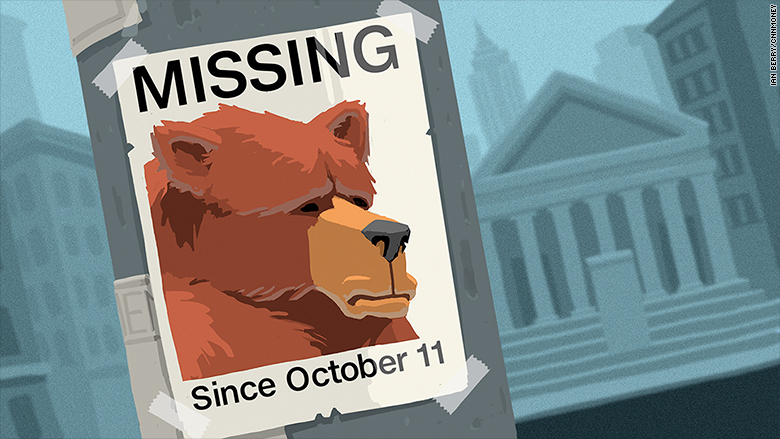 The U.S. election may have awakened “animal spirits” on Wall Street, but the bears definitely didn’t get the wake-up call. They’ve been hibernating for an unusually-long period. Monday marks the 104th trading day in a row without a 1% drop for both the Dow and the S&P 500. That’s the longest stretch without a significant selloff since September 1993 for the Dow and December 1995 for the S&P, according to LPL Financial. It’s an even more impressive feat given all the question marks surrounding President Trump’s “pro-business” agenda of big tax cuts, deregulation and infrastructure spending. Yet the S&P 500 has soared 11% since the election and the Dow has zoomed more than 2,500 points, blowing past the 20,000 and 21,000 milestones. The bears seem to have completely disappeared. The last 1% retreat for the market occurred on October 11, nearly a month before Trump’s victory. “The lack of volatility we have seen the past few months is truly historic,” said Ryan Detrick, senior market strategist at LPL. “If market history has taught us anything, it is that things do even out eventually. We fully expect more volatility later this year,” he said. Wall Street’s remarkable period of calm this year is the polar-opposite to last year’s nerve-racking experience. By this point last year, the S&P 500 had already suffered an incredible 15 different 1% declines, including in four of the first five trading days. There were even three plunges of 2% or more as investors freaked out about crashing oil prices and China’s economic slowdown. Both JPMorgan Chase(JPM) CEO Jamie Dimon and New York Fed President Bill Dudley have recently said the election has awakened “animal spirits” among investors. They were referring to a term popularized by John Maynard Keynes to describe the human urge to take positive action, even in the face of uncertainty. Wall Street is clearly excited by Trump’s promise of big tax cuts and stronger economic growth. Bank stocks have skyrocketed on expectations of faster Federal Reserve interest rate hikes and Trump’s pledge to rip up regulation. Even though the stock market has had some notable up days, those rallies haven’t been ferocious. In fact, Monday is the 59th trading day in a row where the S&P 500 moves less than 1% between its high point and low point. That’s the longest period without a 1% daily range on records going back to 1995, according to LPL. 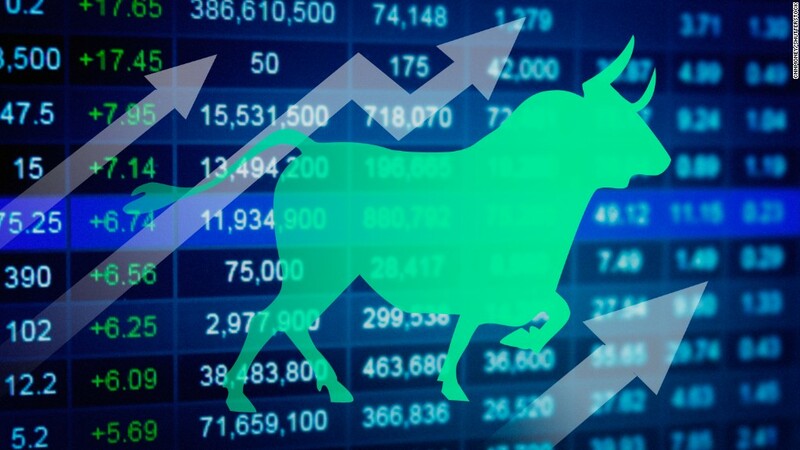 Some believe that the absence of market turbulence is a sign that investors have become overly confident and aren’t adequately accounting for risks. “Complacency is high. The wall of worry seems uncharacteristically-low. We’re due for a surprise on the downside,” said Terry Sandven, chief equity strategist at U.S. Bank Wealth Management. One potential road block for market bulls is the lack of clarity on the timing and size of Trump’s stimulus plans. The White House has promised tax cuts by August, but that timeframe could get pushed back by struggles to repeal and replace Obamacare. “The earlier the better on tax reform,” Glenn Hubbard, the former top economist of President George W. Bush, told CNNMoney. The other problem is that stocks have gotten expensive. The S&P 500 was recently trading at 17.9 times projected earnings, the richest valuation since 2004, according to FactSet. “With stocks priced to perfection, the market is due for a pullback. We’ve come a long way in a short period,” Sandven said. –CNNMoney’s Charles Riley contributed to this report.